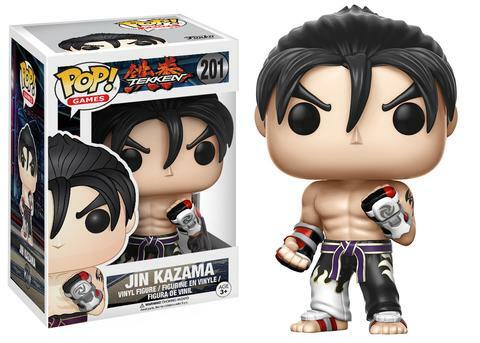 Characters from one of the greatest fighting games of all-time get stylized with Funko Pop Tekken. The set features several iconic fighters from the treasured franchise. Namco developed and released the first Tekken (or TK) arcade video game in 1994, while PlayStation consoles received the original game in 1995. Since its initial release, the TK franchise has seven title games with three spin-off versions. 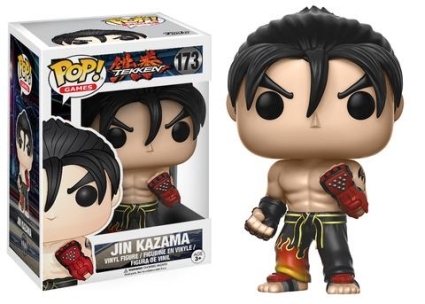 Shop for Tekken Video Games on Amazon. 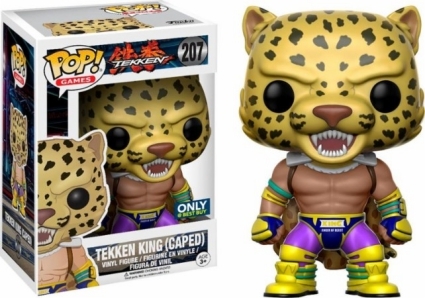 Leading the way, Funko Pop Tekken collectors can find core TK characters who have made appearances in all seven installments. 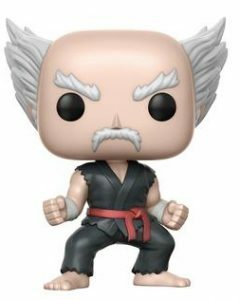 This includes the epitome of evil, Heihachi, in a fighting stance, dressed in a black Gi with his Mishima-style karate belt and trademark white-winged hair. 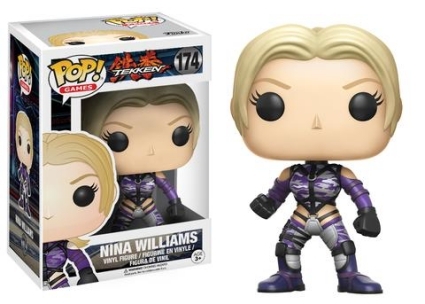 Another option is Nina Williams, wearing her purple and silver camo costume. 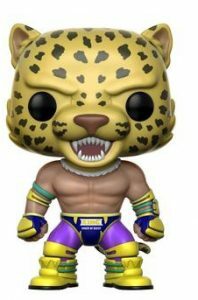 While there are technically two people who don the jaguar mask to portray King, the Lucha libre is considered to have appeared in all of the Tekken games as well. 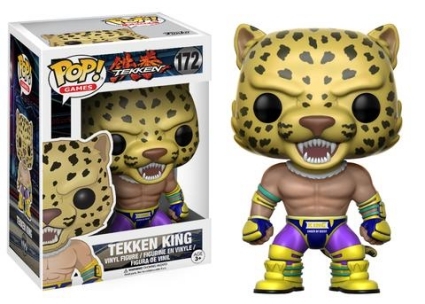 Tekken King stands with his gloved fists clenched, wearing the classic purple spandex and yellow wrestling boots. 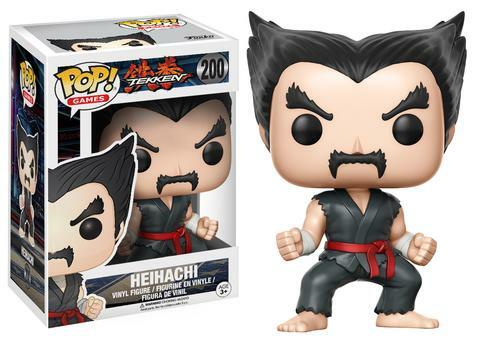 Funko Pop Tekken includes Heihachi’s son and grandson: Kazuya and Jin Kazama. 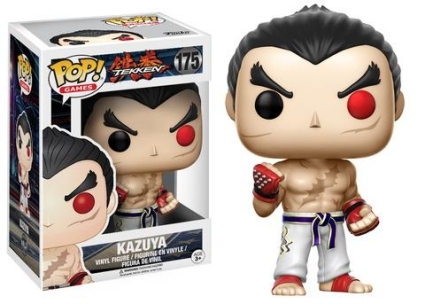 Kazuya’s scars are quite noticeable and the red eye indicates his “Devil Gene” is activated. Wearing black karate pants with a red flame, Jin’s “Devil mark” on his left arm is clearly visible. Numbered as part of the Pop! 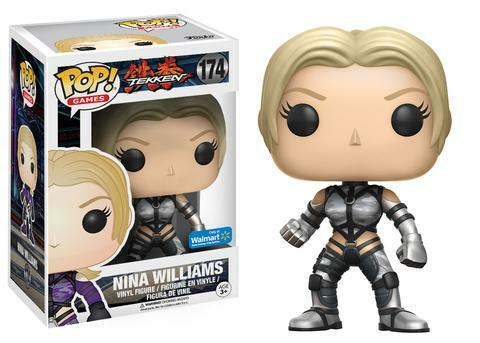 Games line, Funko Pop Tekken offers several retail exclusives including Nina Williams in a silver suit (Walmart), Jin Kazama (Bandai Namco Store), and Tekken King Caped (Best Buy). 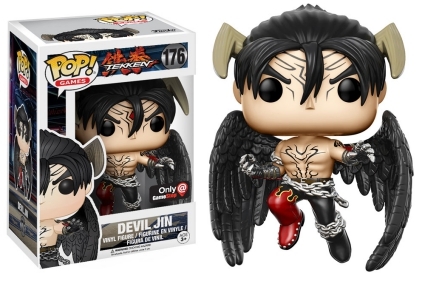 Additionally, Devil Jin and Heihachi in a black and red suit are issued through GameStop. 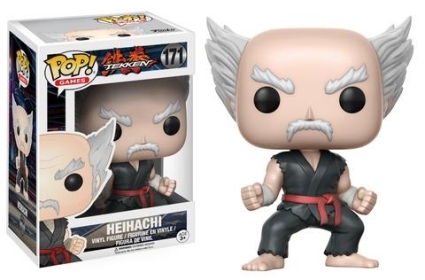 Funko Pop Tekken vinyl figures are numbered as part of the Pop! Games line and stand about 4" tall. 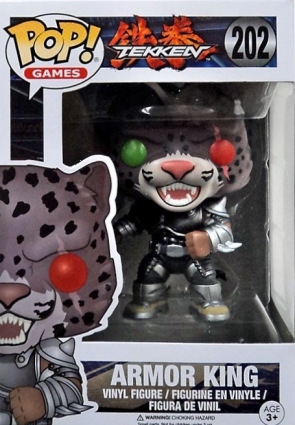 Armor King “Silver Variant” in every box execpt if you get the Armor King “Blue Variant”. Armor King “Blue Rare Variant”, Odd are seemingly a 1 in 6 chance. 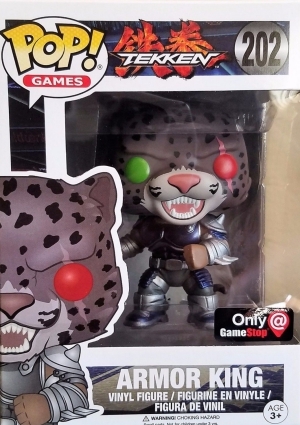 Funko Pop Tekken Blue Armor King - Gamestop Exclusive - Rare Variant!